The restaurant has been shaped into a live size train with an esteem engine; it includes four compartments with 108 seats in total. 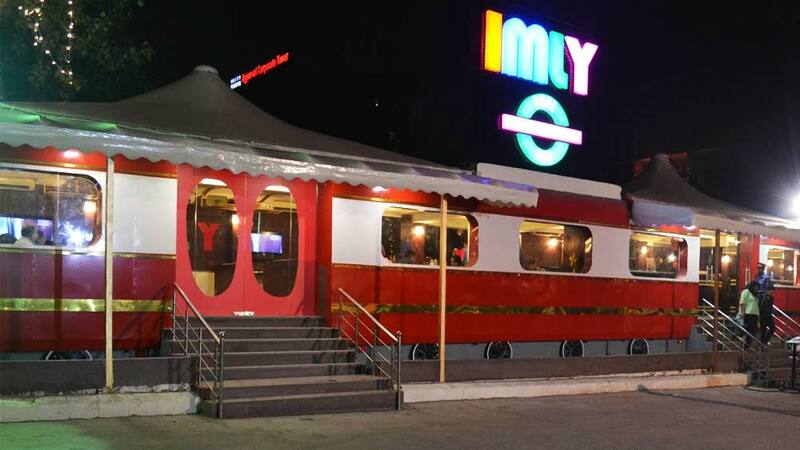 IMLY, a Chatpata Stopover restaurant at Rajendra Place is launching today i.e. 31st October 2015. It is a concept restaurant, of around 250ft long train frontier and the store size is 4000 sq feet. It is like a never ending frontage which makes it the ultimate train. The seating arrangement is done as if you are travelling in a train. The restaurant has been shaped into a live size train with an esteem engine; it includes four compartments with 108 seats in total. Also, at one side you have train like window and on the other side you have running projections. This can give you a feel you are travelling in a train. When you enter into the restaurant, you will feel as if you are sitting in an air conditioned luxury train. “There are many funky things like customaries train type lights, which are used in orient express and we have literally source these lights. Then we have luggage bags which can bring back those train journeys, train memories, travel dairies that we have use to have during the time we use to travel in trains”, shared Varun Puri, Founder at IMLY. The ambience is made like five star restaurants. “Our target customers are the corporate people so that it looks a step higher to fine dine for such a concept. We want the restaurant should be like that people be blown away and can feel like they are sitting in a five star hotel ambience. And also feel as good as that they are only paying 1/10 amount that they pay at five stars”, said Vivek Bhargava, Co-Founder at IMLY. Puri adds, we kept warm wooden type of flooring which is not seen regularly at QSR. But it is the first concept restaurant and we want people to come and witness the restaurant. It is designed by Vishal Gupta- Hookah Pani Company. Their menu involves dishes from different parts of India. It will make you feel like travelling at different destination of India which emphasizes on the great food legacy of the nation. They mix the great essence of conventional cooking systems with innovative ideas. It can be called as a Street Food Spot which has the speciality from all over India. There specialise are Vada Pav, Pao Bhaji, White sauce pasta, Amritsari kulcha with channe, Bedmi aalo, Gatta Malabar, Parantha combo, Tawa Bombay style pulao and many more. Drinks are served in Banta bottle as a welcome snacks. The shikanji drinks have different Indian flavours for instance Ginger, Pineapple and Mango. Food is also very affordable within a range of 60- 180. Their concept is unique for their menu is to pick at least one dish from each Indian State. Their deserts are quite nice like Bundi Pag Rabri. The highest traffic hours are at the lunch time 12-4pm. The budget of the restaurant is 2-2.5crore for the single outlet. It is a friendly place as it is said that train is the best place to connect with people. And at the same time you are served with the food from the native place. This is also the first restaurant in history that had launched their outlet by inviting 100 children from CRY. Here are some of the best food trucks to please yo..